DBA GLOBAL SHARED SERVICES, INC.
Bachelor’s degree in Accountancy or equivalent; CPAs and non-CPAs are welcome to apply; Background or experience in the following areas is an advantage; Mortgage experience; Exposure in lending institutions or credit; Banking and finance; Experience from “Big 4” accounting firms or international accounting firms; Can work in a fast-paced environment, ability to work under pressure and meet deadlines; Supervisory experience in a accounting, financial reporting, tax and IFRS is a plus; Strong oral and written communication skills; Microsoft office proficient. Female; 20 – 28 years old; Single; BS Psychology and/or BSBA in Human Resource and Development Management graduate; With at least one(1) year work experience as HR Staff; Computer literate especially in Windows-Based Programs; With good oral and written communication skills; Excellent interpersonal skills; Highly organized result-oriented and trustworthy,; Have high attention to details; Willing to work under pressure with minimum supervision. AYU PROPERTIES MANAGEMENT LTD., INC. Female; At least College level; 20 – 30 years old; Experience is an advantage; Hardworking. APG INTERNATIONAL AVIATION ACADEMY, INC. 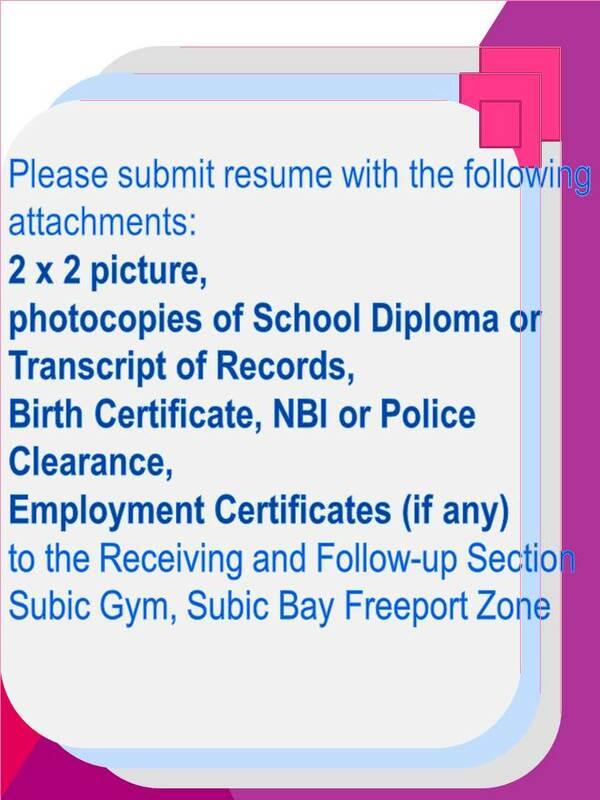 Male / Female; With pleasing personality; Bachelor's degree/preferably BS Management; Fluent in English/Filipino language/knowledge in Chinese language is a plus; Must know MS Office. Male / Female; With pleasing personality; Bachelor's degree/preferably BS Management; Fluent in English/Filipino language/knowledge in Chinese languages is a plus; Must know MS Office. Male; Not more than 40 years old; With excellent technical knowledge and skills to motors, contactor, relays and etc. ; Must possess relevant College or Vocational diploma; With at least 2 – 3 years technical experience in the electrical industry; Can understand and speak English Language; Has strong leadership skills. Male; Not more than 40 years old; Must possess relevant College or Vocational diploma; With at least 1 year experience in Electrical/Mechanical works; Can work under pressure and with minimal supervision; Must have good time management; Willing to render overtime. Male; 20 – 35 years old; At least High School graduate; With experience in similar job; Physically and mentally fit; Must be capable of handling work pressures.